Prosperity IQ Quiz - Improve Your Score. You've taken the test. You know your Prosperity I.Q. And you're ready to improve it. Now discover the NEXT STEP that will eliminate your money challenges once and for all, and empower you to effortlessly, reliably, and consistently attract the wealth and happiness you want. GO BEYOND the Law of Attraction to the LAW OF CREATION... and step into a world where opportunities manifest spontaneously. Where you align with the universe automatically. Where you don't have to wait for the things you want to come to you - THEY'RE ALREADY HERE! Yes! I'm ready to receive total abundance - here and now! I can order today at a special discounted price! YES! I'm ready to receive total abundance - here and now! 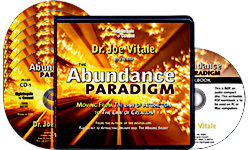 Please send me Dr. Joe Vitale's bestselling 6-CD audio program The Abundance Paradigm: Moving from the Law of Attraction to the Law of Creation, plus the Writable PDF Workbook for just $69.95, which is 70% OFF the regular program price. My order today is completely RISK-FREE! If I don't immediately see and receive MORE of what I want after using these techniques, I can return the program any time within 30 DAYS for a full refund of the program price - no questions asked!